Have you ever wondered what "Scopus" means? Scopus from Elsevier, newly acquired by the University Libraries, is the largest interdisciplinary abstract and citation database of peer-reviewed literature and features smart tools to track, analyze, and visualize global research. With the recent cancellation of Web of Science, another major citation database, Scopus is now the best option for peer-reviewed interdisciplinary research, citation searching, and citation metrics for WSU users.The direct link to Scopus is https://libraries.wichita.edu/scopus. The database is also found in the library's A-Z Database List. For WSU faculty, staff, and students. To register for a webinar, click on the date and time below. Learn how to search by topic, author, and affiliation; create citation alerts; do cited reference searching; and use citation metrics to assess impact of published research. Learn advanced searching methods to help save time when doing literature reviews. Get a more in-depth review of Scopus tools for assessing research impact such as citation analysis for authors, comparing journals with CiteScore, and using PlumX article-level metrics. Scopus is an interdisciplinary database that is international in scope. 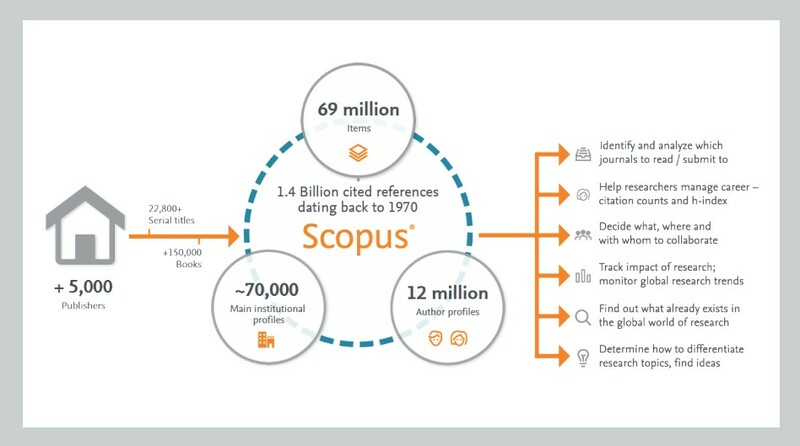 Updated daily, Scopus includes over 71 million records and 23,700 titles from more than 5,000 publishers including over 21,500 peer-reviewed journals (with over 4,200 full open access journals), over 360 trade publications, and articles-in-press. Scopus also has records for more than 120,000 books and more than 530 book series including monographs, edited volumes, major reference works, and graduate level textbooks as well as over 6 million conference papers from proceedings and journals, and patent records. Scopus provides 100% Medline coverage. One of its most important features is cited reference searching which allows users to search for who has cited a given article. Coverage for journals indexed in Scopus generally goes back to 1970 with book citations back to 2003. However, citations to earlier literature can be found through references and bibliographies of indexed articles. For more information on Scopus content, go to the Current Content List. For a list of journals included in Scopus, go to the Source Title List. For a list of book titles, go to the Book Title List. The Scopus search interface has changed since this guide was produced in 2014. However, the guide demonstrates many of the features and capabilities still present in Scopus, but with a somewhat different look and feel. How to log in and register with Scopus to take advantage of features such as alerts. Tutorial text only. Demonstrates features available on Search Results page. Tutorial text only. Demonstrates features available on a Scopus Document details page. Tutorial text only. How to find and track an author's publications, as well as review author details. Tutorial text only. How to find affiliations, as well as reviewing affiliation search results. Tutorial text only. Demonstrates features available on the Affiliations details page. Tutorial Text only. You can download multiple PDF documents at one time. The Document Download Manager (DDM) feature allows to select and automatically download, rename, and save up to 50 documents at one time. You will have to download the Scopus Document Download Manager from the chrome web store before using it in Scopus. Use Direct Export to transfer records from Scopus to your EndNote Library. Run a search on Scopus. Mark records you want to export by clicking on box to left of each record. Select Export. Using drop-down menu, change Export Format to RIS format (Reference Manager, ProCite, and EndNote). For Output, select Complete Format to export as much information as possible if you are not sure what to select. Select Export. Select Open when the dialog box opens and asks if you would like to save or open the file. Then select the EndNote library into which you want the records transferred, and once the library opens, the records will be automatically transferred. To be notified by email of new documents in Scopus that match a particular search, create a search alert from the Search Results page or from your Saved Searches page in My Scopus. Enter and run a search. Above the Search results, click Set alert. In the Name of alert field, enter a name for the alert. Enter an E-mail address for alert notifications. Note: You can also enter email addresses of colleagues. Separate multiple email addresses with a semicolon, comma or space. From the Frequency drop-down list, select how often you want to receive alert email notices. Note: You do not receive an email if there are no alerts during hte frequency you select. Select Active or Inactive as the status of your alert..
To be alerted by email every time a selected document is cited on Scopus, create a Document Citation Alert from the Documents Details page or the Alerts page. 2. On the right, you will see a box that shows the number of times this particular paper has been cited in Scopus. To be notified by email when an author is cited on Scopus, create an Author Citation Alert from the Author Details page or from the Alerts page. 1. Select the author from either the search results or the Document Details page. 2. From the Author Details page, you can create two types of author alerts. Alerts"” beneath the top box. In Scopus, you can access multiple metrics at the journal, article, and author levels that help assess the value and impact of published research. For a summary of key research impact metrics, many of which are included in Scopus, see the Quick Reference Cards for Research Impact Metrics poster, developed by Library Connect, an Elsevier publication. Scopus has a suite of metrics for Source journals and other serials indexed in Scopus including supplements, special issues, and conference proceedings. Each source title in Scopus has its own Source Details page which includes multiple journal metrics including CiteScore metrics, SCImago Journal Rank (SJR), and Source Normalized Impact per Paper (SNIP). These are all freely available in Scopus at www.scopus.com/sources. For a tutorial on using the Scopus Sources page, go to https://tutorials.scopus.com/EN/AnalyzeJournals/index.html​. These metrics include eight indicators derived from the Scopus database that offer an accurate indication of a serial's impact. CiteScore itself is the average of the sum of the citations received in a given year to publications published in the previous three years, divided by the sum of publications in the same previous three years. CiteScore is calculated for the current year on a monthly basis until it is fixed as a permanent value. Once fixed the other CiteScore metrics are also computed.The other seven metrics are CiteScore Tracker, CiteScore Percentile, CiteScore Quartiles, CiteScore Rank, Citation Count, Document Count, and Percentage Cited. CiteScore metrics are freely available at www.scopus.com/sources and found on the Source Details page for each source indexed in Scopus. For more information, go to CiteScore Metrics: The Basics. A prestige metric that can be applied to journals, book series, and conference proceedings. With SJR, the subject field, quality, and reputation of the journal have direct effect on the value of a citation. The SJR calculation is the average number of weighted citations received in a year divided by the number of documents published in the previous three years. SJR weights each incoming citation to a journal by the SJR of the citing journal. A citation from a high-SJR source counts for more than a citation from a low-SJR source. Calculated annually, SJR is powered by Scopus data and is freely available with CiteScore and SNIP at www.scopus.com/sources. Measures contextual citation impact by weighting citations based on the total number of citations in a subject field. The impact of a single citation is given higher value in subject areas where citations are less likely, and vice versa. SNIP is calculated as the journal's citation count per paper divided by the citation potential in its subject area, defined as the set of publications citing that journal. SNIP measures contextual citation impact and allows comparison of journals in different subject areas since the value of a single citation is greater for journals in fields where citations are less likely and vice versa. Calculated annually from Scopus data, SNIP is freely available with CiteScore and SJR at www.scopuse.com/sources. These metrics quantify the impact of individual articles. Scopus now uses PlumX Metrics as the primary source of its article-level metrics, along with traditional measures such as citation counts to present a more comprehensive picture of an individual article's impact. The Article Metrics module is found on the Document details page in Scopus. A sidebar highlights the Scopus citation count, field-weighted citation impact, and PlumX metrics. Click on "View All Metrics" to get a more detailed metrics page that displays all available mertics. PlumX Metrics relate to all the ways people interact with an individual publication in the online environment such as usage, captures, mentions in new articles or blog posts, and social media tweets, Facebook likes, etc. For a tutorial on using article-level metrics in Scopus, go to https://tutorials.scopus.com/EN/Metrics/index.htmlFor the text only version, go to https://tutorials.scopus.com/EN/Metrics/sc_Metrics_textOnly.html. A measure of productivity and citation impact, h-index is defined as the greatest number of publications h for which the count of lifetime citations is greater than or equal to h. This measure favors older and more productive authors. The measurement depends on both quantity (number of publications) and quality (number of citations) of an author's publications. Collection of in-depth and visual analysis tools designed to provide a information on an author's publication history and impact. Includes the number of times each document has been cited per publication year. The name, Scopus, was inspired by the wading bird, Hamerkop (Scopus umbretta), found in Africa which supposedly has excellent navigation skills. (Burnham, JF. Scopus database: a review. Biomed Digit Libr. 2006 Mar 8;3:1. doi:10.1186/1742-5581-3-1) From Scopus Library Guide, University of Washington Libraries, Health Sciences Library.